As winter comes to an end, it has definitely taken a toll on my skin. I am always looking for the "miracle cream" that's going to cure my itchy dry skin without irritating it. That's why I was excited to try this raw shea butter by 24 Karite Gold. Because it's so thick, a little bit goes a long way. Besides the skin ailments listed below, this shea butter can also be used to reduce wrinkles, soothe irritations, alleviate dryness, and minimize redness and inflammation. It's rich in vitamins C, E and A. It's even indicated for use on oily and acne prone skin. The first thing I thought to try this on is my cracked heels on my feet. Sandal season is coming fast, and cracked heels with sandals is the worst! The first time I applied it, I made a huge mess walking around my house afterward, and slipped on my kitchen floor. If you are going to apply it to your feet, I highly recommend putting socks on directly after applying it, which will also helps the shea butter soak into your feet better. I noticed a difference the first time I applied it, and it only got better the more that I used it. After applying it to my feet, I finished rubbing the rest into my hands, and even though it felt oilier than I like on my hands, it soaked in quickly and made my hands super soft. My daughter had a dry patch of skin on her neck that wouldn't go away. Every lotion she used on it would only aggravate it and make it more red and worse. She had eczema as a child, so it was probably something related to that. The only thing she was able to use before trying this cream was straight petroleum jelly (Vaseline), but even that wouldn't cure it. 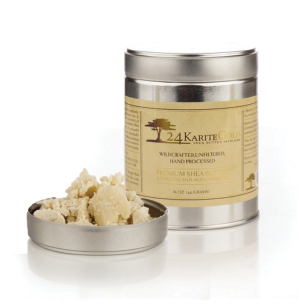 We noticed a difference right away when using the 24 Karite Gold shea butter. Not only did it help cure the dry spot, but it didn't aggravate it make it worse. Because this cream is highly concentrated, a little bit goes a long way. Starting at $15.99, you can purchase it on their website in 16 oz, 36 oz, and 1 gallon tubs. Because we loved this product so much, we want you to have the chance to try it out! We are giving away 16 oz jars of it to THREE lucky winners! Simply enter the Rafflecopter below to enter to win. Deadline to enter is Monday April 18th at 11:59pm. Winners will need to provide a mailing address and shea butter will be shipped to them. I would definitely use it on my feet (with socks! ;) and my elbows. I would use it on my hands, they tend to get really dry especially when I do a lot of cleaning. i will use to help soothe my dry skin and in my hair. I would use it for my crazy dry heels!